Not that I am starting to deviate into Mexican cuisine, but since I just got back from Cabos San Lucas last night, I wanted to pursue my Mexican and seafood adventures with this refreshing and delicious cocktail. 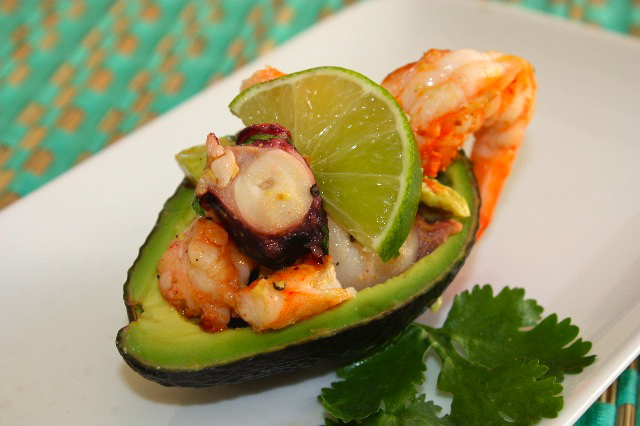 The abundance of avocado, seafood, lime and hot peppers is what I loved most about Mexican cuisine. I knew the traditional Mexican dishes you get in California, such as quesadilla, tacos, burritos and fajitas, but never really explored further their more delicate and fragrant cuisine. So this small and easy dish was inspired by what I discovered in a small restaurant in La Paz right in front of the ocean, a beautiful and fresh octopus cocktail served in a glass. In France, we do use avocado shell to serve avocado based appetizers, the only problem is that you need a large haas avocado or you won’t be able to fit a lot of the stuffing. You can of course use a large cocktail glass to serve this, or two avocado halves per person. I had never been to Mexico before this trip just because usually during the summer vacation I go back home. For many reasons, I could not go home this year. So I had to find a place close by where I felt I was completely “dépaysée” (away from my natural environment) and recharge my batteries. 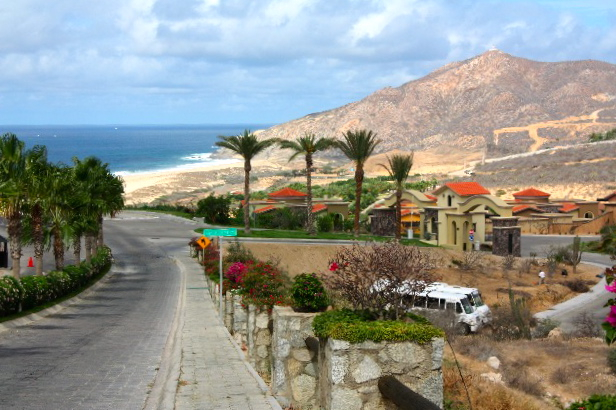 Los Cabos, in Baja might not be the typical Mexican city but I loved it. You can find Starbucks and Costco which I thought were somehow out of place, selling American fruits to the locals at outrageous prices. We get Mexican mangos and they get American peaches. 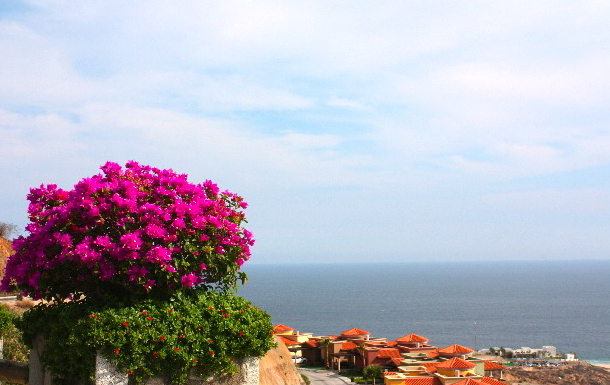 La Paz was a lot more Mexican than Cabos and a lot cheaper too. The warmth and hospitality of the locals, the cuisine, the burning sun, the ocean and everything else that makes Baja very special. 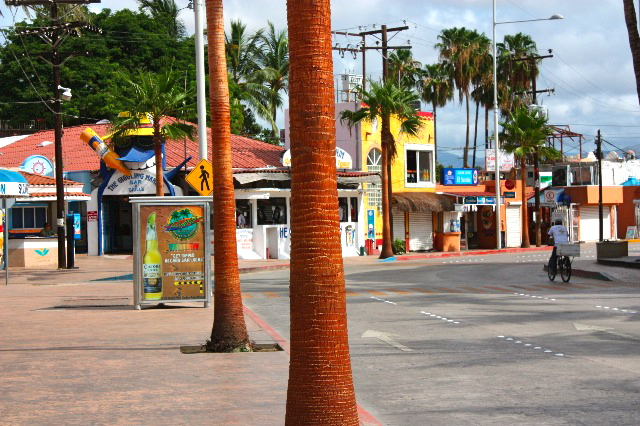 That long and narrow peninsula has so many wonderful assets ;its where the Pacific meets the Sea of Cortez, where the desert meets green plains, where you can relax and pamper yourself in the amazing spas, or get more adventurous and drive along the coasts and discover tiny and colorful Mexican villages. The beach… I am not really a beach maniac, and did not lay down to get a tan, but even with a 100 sun block and in the shade, you get burnt…I was lucky enough to not have a bikini incident, so everything was perfect. I have never met people so adorable and hospitable, people would go out of their way to help you with a genuine desire to do so and sincere smile. I will be back! Now that I am back to real life, I will have to catch up with everyone and see what’s cooking and what everyone has been up to during this last month. I apologize for being such a terrible “supporter”, but I will get back in touch with everyone very soon. Cook octopus for a few hours in salted boiling water. Let it cool and cut in small pieces. Saute shrimps in olive oil and add to the octopus. Cut avocado in halves, using a teaspoon, scoop some of its flesh, leaving about 5 mm of avocado on the shell. Cut the scooped avocado in small pieces. Coat the avocado halves with lemon juice to prevent them from darkening. In a mixing container, add all other ingredients and mix well. Mix diced avocado with seafood, and pour vinaigrette on mixture. Spoon into the avocado halves. Decorate with lime slice and serve. This entry was posted by silvia on August 24, 2010 at 5:32 am, and is filed under Appetizers, Fish/Seafood. Follow any responses to this post through RSS 2.0.You can leave a response or trackback from your own site. Oh, lovely vacay! 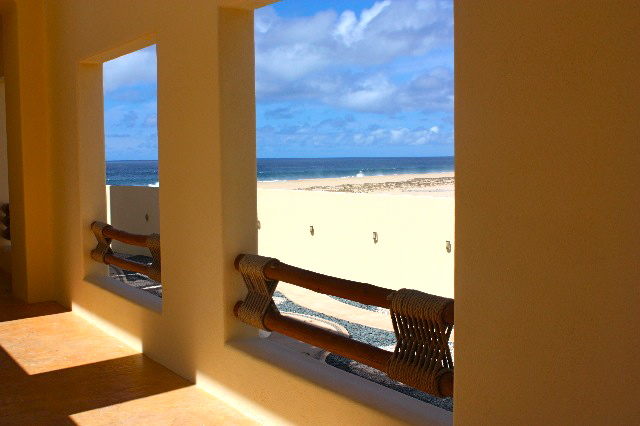 Cabo is always great for a get away. The avocado looks delicious! welcome back! i wasn’t expecting the photos to show such a beautiful countryside, but they look very pretty and relaxing! glad you got to get away for a bit, and thanks for bringing a seafood recipe back with you! 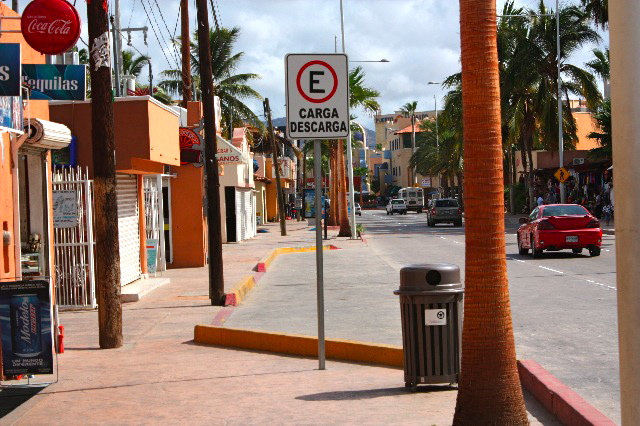 Welcome back, I had went to Cabo a few years ago, we just got back from Cozumel this time. 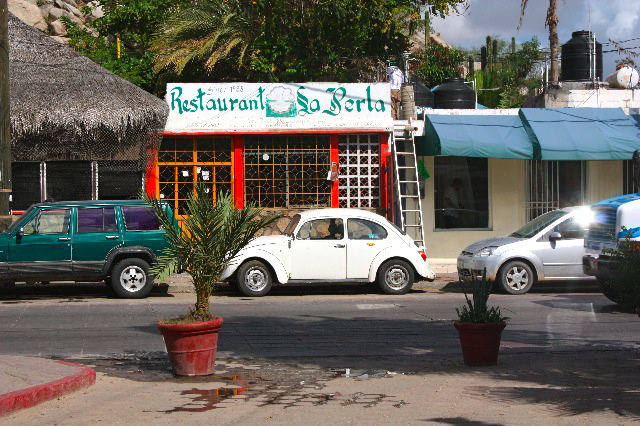 You have some great shots here~ love this avocado, makes me want to go back! it was 105 degrees there…you look fabulous and so peaceful! Tu vois les choses les plus simples sont les meilleures! Je serais si contente avec des repas comme celui-ci, de préférence au bord de l’eau. Le Mexique est un pays fabuleux. Welcome back, Silvia! Oh boy, your photos are stunning. The last few photos look fantastic. I’m sure you’re having a wonderful time there. So, where’s your bikini photo? haha…. The cocktail salad looks very appertizing. Thanks for sharing & enjoy your day. Great recipe. And beautifully presented. Your vacation looked perfect. The water is such a beautiful colour and I love the cactus garden. welcome back ,silvia,i miss you and i miss the french touch of your food in the internet aria!stuffed avocado looks great! Oh Silvia~ this looks like something I could eat morning, noon, and night! 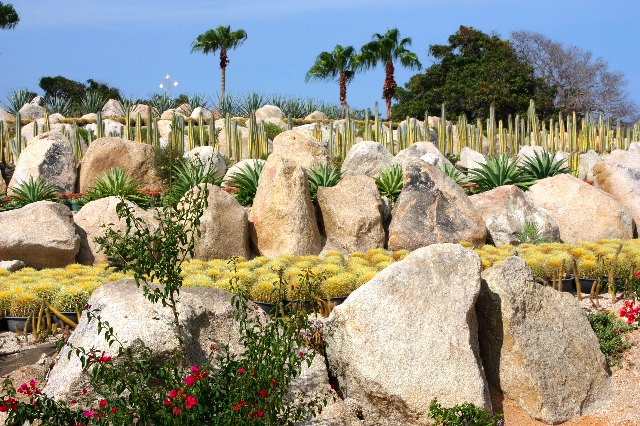 I’ve been to Los Cabos and it is a very unique place! I hope you feel well rested! Wow! Silvia, ce voyage a eu l’air vraiment super. Tes photos sont splendides, pleines de lumière du sud, de couleurs. Cette recette a l’air très bonne, très fraîche! Nice of you to come back strong with a lovely dish. You have a delicate way with octopus. I am glad to see it featured here in many of your courses. I’m happy you were able to getaway. You took some fantastic photos. Welcome back! You deserve a well needed vacation. It looks like you had a blast and ate very well! Beautiful photos! Glad you were able to recharge and come back with inspiration for such a refreshing south-of-the-border dish. Welcome back! You didn’t miss a beat diving right in and delivering with another beauty–Mexican inspired this time. Thanks for the beautiful pictures, too. I always enjoy seeing where everyone’s been. 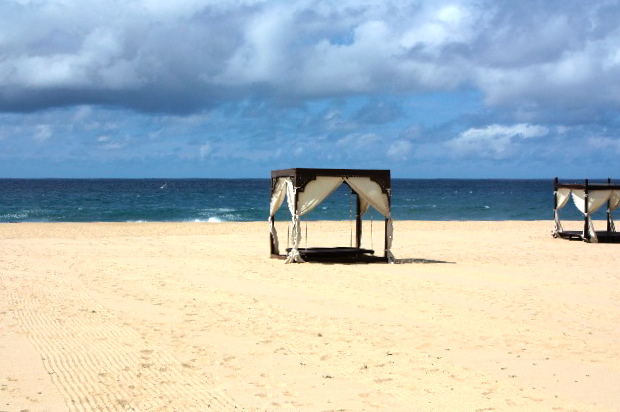 Thanks for sharing the beautiful escape to Cabo San Lucas. It looks gorgeous! I can’t believe you were back last night and already have a creation and post! I think you’ll catch up to the food world in no time. Such a gorgeous place…thank you for taking me along on your trip. I was captivated from beginning to end. And this recipe sounds absolutely delightful….healthy, fresh and vibrant. Thank you for sharing! Lovely photos, Silvia! What fun. And I’m adoring the stuffed avocado! 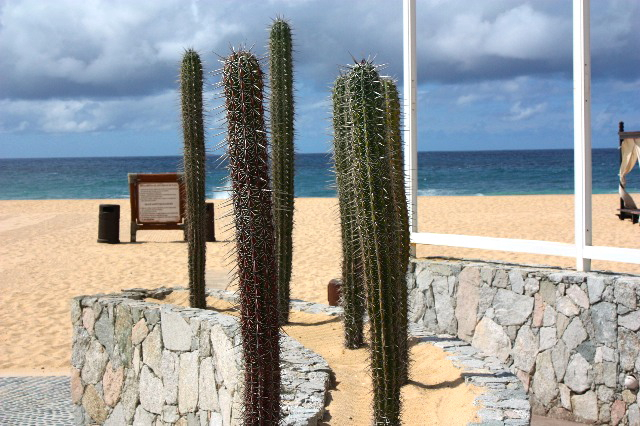 Feeling re-energized…I sure hope so…by the look of those gorgeous photos…Cabo seemed like a great place for inspiration. What beautiful photos! Thanks for a taste of vacation! Welcome back! I am so glad you found some more out-of-the-way and less touristy places. Of course I knew you would. I am like you and never lay out to get a tan, but it looks nice to relax in the shade. Great photos!